Place 1.5 cups red lentils into a wire strainer, and set the strainer in a large bowl of cold water for one hour. When lentils have soaked for 40 minutes, slice up 8-12 mini sweet peppers into bite-size portions. After one hour lentils soaking, rinse them under cold tap water, then dump them into a 5-quart sauce pan, add 3 cups water and three tablespoons virgin olive oil. Place lentil-filled sauce pan on stovetop burner, keep lid off, and set the burner to highest temp, until the lentil water starts to boil. While waiting to boil, chop up one large Russet potato into bite-size chunks. Once the pot comes to a boil, lower temp to medium heat, and add the sweet peppers and potato. Cover partially (leaving just a thin crescent open to the air). After 20 minutes or so, lower temperature to medium-low, and let the soup finish simmering until the potato chunks are soft enough to easily pierce clean through with a fork. This should take around 20 more minutes or so (therefore total cooking time is around 40 minutes). Remember to stir every few minutes! Note: this recipe is intended for a very thick soup: though you should add a little more water if needed, to prevent burning. When the soup is almost done, crush and slice an entire, small bulb of garlic (or equivalent). Add thinly sliced, chopped, or mashed garlic when soup is done. Keep sauce pan covered for another ten minutes, so the garlic oils may infuse. 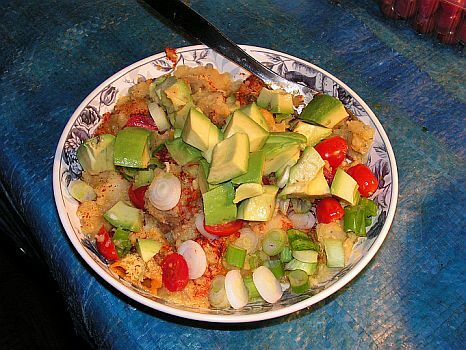 An entire small to medium fresh avocado, sliced into small chunks. Rib-stickingly delicious! This is a purely vegan recipe, though you may add any sort of cheese, meat or fish if you like. I enjoy a small dish of cracked green olives on the side. You are currently browsing the archives for the Vegan category.